WHY: Women’s clothing at a discount at the Amy Matto Sample Sale. 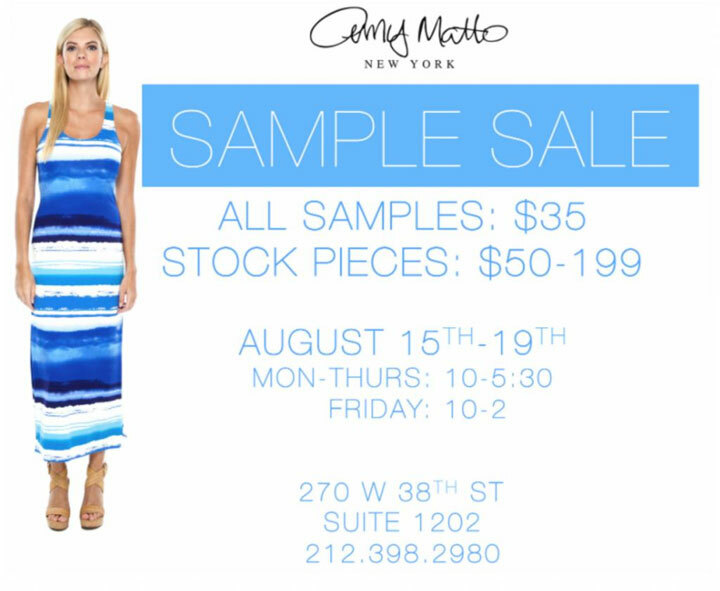 WHY: Women’s clothing at up to 75% off retail prices at the Amy Matto Sample Sale. Samples are $35 and overstock is $50-$199. WHY: Women’s clothing at up to 70% off retail prices at the Amy Matto Sample Sale. Shop dresses, skirts, pants, and blouses from the Fall/Winter 2015, Holiday 2015, and pre-Spring 2016 collections in sizes 0 through 12. Samples will be $35, and dress will be priced between $50-$199. Samples for $35 and dresses for $50-$199. Amy Matto is a contemporary women’s dress collection, made entirely in NYC’s garment district. Recognized for smart, stylish, and versatile silhouettes, Amy’s dresses are perfect for taking any woman from day to evening.